The ADLINK PXIe-9848/9848H is an 8-channel, 14-bit, 100 MS/s digitizer delivering both high-accuracy measurement results and high-dynamic performance. With a PXI Express bus interface and ample onboard acquisition memory up to 512 MB, the PXIe-9848/9848H can easily manage simultaneous 8-CH data streaming. High density and high speed digitizer features ideally position the PXIe-9848/9848H for applications such as LIDAR, radar signal acquisition, and PSU (Power Supply Unit) testing applications. The PXIe-9848 provides a flexible set of input ranges from ±0.2V to ±2V, software selectable 50Ω or 1MΩ input impedance, a wide variety of triggering options and tight synchronization capability, all maximizing convenience of use. 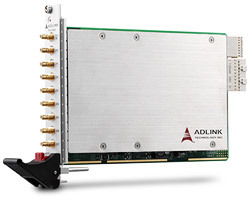 In addition, ADLINK provides the PXIe-9848H, features a x15/x50 signal condition module providing both high input voltage range of ±100V and high dynamic performance, delivering the optimum solution to measurement range expansion in a PXI system. Benefiting from PXI Express architecture, users can synchronize multiple PXIe-9848 digitizers to mount a test system providing up to 64 channels in a single 9-slot PXI Express chassis. PXIe trigger functions enable all channels to sample simultaneously and synch to each digitizer. The PXIe-9848 provides built-in memory up to 512 MB for massive data storage, enabling users to extend acquisition for preset durations. The PXIe-9848 provides a flexible set of input ranges from ±0.2V to ±2V, software selectable 50Ω or 1MΩ input impedance, a wide variety of triggering options and tight synchronization capability, all maximizing convenience of use. The ADLINK PXIe-9848H incorporates a x15/x50 attenuator allowing the PXIe-9848 to perform as a signal conditioning module. 8 simultaneous analog inputs and 15:1 or 50:1 attenuation ratio allow high input voltage range of ±100V. Input impedance, analog input connectors, over-voltage protection, and dedicated mechanical design match the attenuator board flawlessly with the PXIe-9848. The attenuator delivers the perfect solution to measurement range expansion in the PXI system. During manufacture of power supply units, quality validation is required before shipping. Critical technical parameters include rising time, overshoot, and turn-on delay, with analysis thereof ideally conducted directly on the processing line. Conventionally, manufacturers have employed complicated power measurement instrumentation for these duties, with the benefits of precise measurement for all of power parameters, but at the expense of cost and space required. As well, in most cases, only a single unit can be tested at a time, an extreme impediment to efficiency and potential production bottleneck. By taking advantage of the inherent modularity of the PXI interface, however, power supply unit test systems can quickly adapt to changing measurement requirements with increases in performance and speed of units to be tested. ADLINK? ?s PXIe-9848H 8-channel, 14-bit, 100 MS/s digitizer, featuring both high-accuracy measurement results and high-dynamic performance, is uniquely suited to application in Power Supply Unit testing operations. The 14-Bit capability can detect low ripple noise up to µV grade, and the 100MS/s & 100MHz high-bandwidth can sample µs grade rapid vibrational rise times. The PXIe-9848H can easily meet and exceed further sampling challenges utilizing complicated QC characteristic parameters, including overshoot, delayed startup, and many others. With a PXI Express bus interface and ample onboard acquisition memory up to 512 MB, the PXIe-9848 easily manages simultaneous 8-CH data streaming. Synchronization of multiple PXIe-9848 digitizers, to mount a test system providing up to 64 channels in a single 9-slot PXI Express chassis, is easily accomplished. The multi-channel design significantly saves time and enhances efficiency of production line testing, making it an ideal high performance modular digitizer solution for power supply manufacturers.